Do not believe anyone telling you the European banking sector is healthy. None other than the European central bank, the ECB, is aware of the problem, having just confessed to it. The news was only mentioned in passing in some specialized magazines, but it deserves to be put under the light. One of the ECB’s directors, the Frenchman Benoît Coeuré, has said that “there may be room for another TLTRO (L’Agefi). 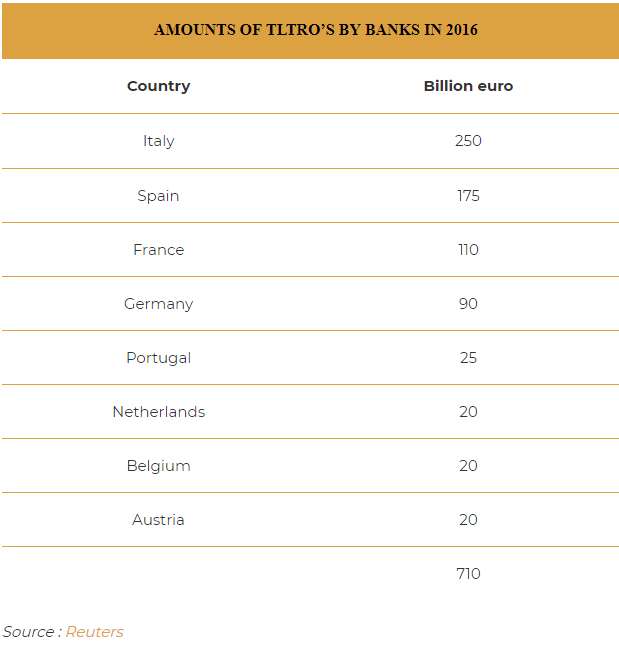 The amounts involving banks of several countries in 2016 have been estimated by Reuters. We’re aware of the degraded situation of Italian and Spanish banks, like that of Deutsche Bank, Commerzbank, and several other regional German banks. But what constitutes a surprise is that France is taking the third position, ahead of Germany, even though the difficulties facing Germany’s largest bank are worrying a lot of people in Europe and elsewhere in the world. Are some French banks hiding something? Since January 1st, the ECB has stopped its QE or ended its bond buy-back programme. All of 2.6 Trillion euro wasted on them served no purpose, as we have mentioned. They’ve had no effect whatsoever on economic growth. Their true usefulness will only have been to keep interest rates low so that States could continue to go into more debt, and to provide liquidity to banks in need of cash. So for ailing banks, there’s nothing that will fix it but another round of TLTRO. Disclosure: The information in this document has been obtained from sources, which we believe to be reliable. We cannot guarantee its accuracy or completeness. It does not constitute a solicitation for the purchase or sale of any investment. Any person acting on the information contained in this document does so at their own risk. Recommendations in this document may not be suitable for all investors. Individual circumstances should be considered before a decision to invest is taken. Investors should note the following: Past experience is not necessarily a guide to future performance. The value of investments may fall or rise against investors' interests. Income levels from investments may fluctuate. Changes in exchange rates may have an adverse effect on the value of, or income from, investments denominated in foreign currencies. GoldCore Limited, trading as GoldCore is a Multi-Agency Intermediary regulated by the Irish Financial Regulator. Wow, the ECB will treat the banks like Greece. It is a tragedy but there is a certain humor in it. Only difference between Greece and the banks is that the bank leaders will fare better than the little nation that was tortured by the ECB.